When the movie Star Wars came out, France was still using the Guillotine for executions – a curious factoid that points up that what seems like a long time really may not be. 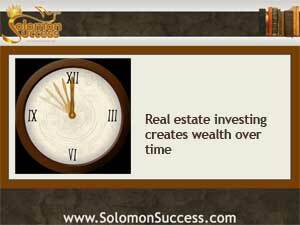 King Solomon tells us in his Proverbs that wisdom offers “length of days,” (Proverbs3:5) along with riches ad prosperity, and it’s that way of looking at time that makes for success in income property investing, which, as Jason Hartman says, is the most reliable way to create long term wealth – over time. Investment properties offer a regular, predictable income from the steady collection of rents. Because, as Jason Hartman says, everybody always needs a place to live, rental properties with good tenants are a stable investment that takes advantage of the current explosion in demand for rental housing. Because of the enduring nature of real estate, property investment can ride out the ups and downs of economic shifts and keep cash flowing over the long term. Long term fixed rate mortgages keep an investor’s own assets safe. Equity isn’t always as safe as it may appear. Working against time by paying off a mortgage – or worse, paying it off early – leaves an investor with few protections if disaster strikes or expenses mount. The old standby, the 30-year fixed rate mortgage that locks in int erest rates for the life of the loan, is a key piece of investing success. Time is also on an investor’s side thanks to the numerous tax breaks for investment properties, which allow deductions for depreciation over time and for interest carried on those long term fixed rate mortgages, among other things. There are even deductions for periods when a property remains unrented for a certain period of time. House flipping and making money from short sales can put quick money into an investor’s pocket. But the yield from these purchases and sales disappears quickly, and there’s no chance of a long term return since the turnover is quick – a perception about time that doesn’t always work in an investor’s favor.